Me2UFitness opened its doors in the middle of January and Christina Dillon has been very busy since welcoming clients old and new. Christina has built up a solid client base over the years and continues to welcome new clients to her new studio in the SCCUL Enterprise Centre in Ballybane. Christina’s fitness studio is the only one in the Ballybane area offering one to one personal training, nutrition and fitness classes. 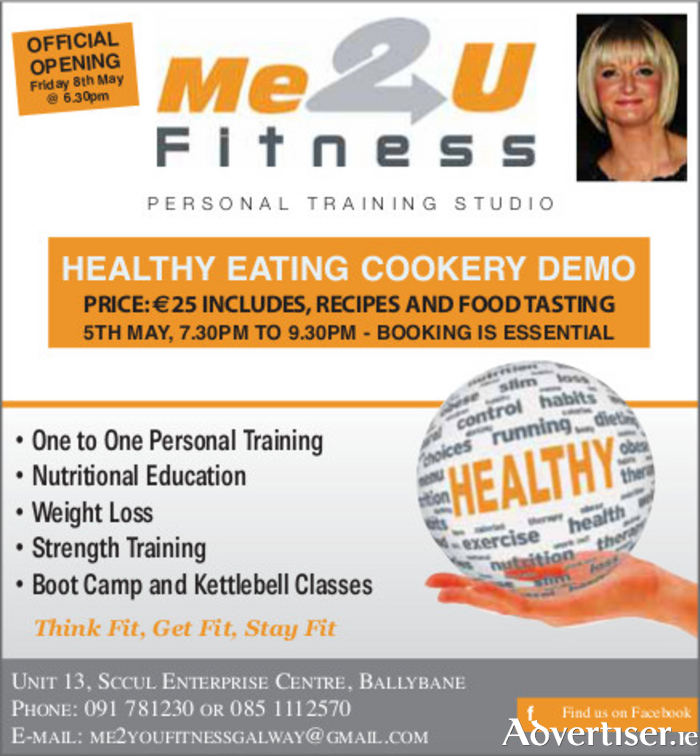 Me2UFitness is having its official opening on Friday 8th May. All are welcome to call into the studio and find out exactly what Christina does. She will be giving demonstrations throughout the day, chatting with people and giving advice on fitness and health. The launch party will then begin at 6.30pm with a drinks reception, canapés and some entertainment. A special guest will cut the ribbon and officially open the studio. As part of the official opening, there will be a special launch promotion running from Fri 1st May to Mon 11th May for a 4 week program, which includes a full nutritional consultation, easy to follow food plan and 12 one to one personal training sessions for €120 (normally €180 ). Quote official opening to receive this offer. Call 091 781230 or 0851112570.